The Briartown Baptist Church, located on Briartown Church Rd.approximately two miles from the Nantahala School,is still searching for information about its beginning. There seems to be a connection between the Western Mt.Pleasant Baptist Church and Briartown, but at this time we lack the facts needed to clarify the relationship. On March 15, 1863, a meeting was held in the neighborhood of Briartown, and a presbytery comprised of the Reverends Merritt Rickman, Samuel gibson, Mark May, and William M. Deweese conducted the meeting. The Reverend Rickman was moderator and Reverend May, clerk. The purpose was to organize a church, and the minutes of that meeting show the following membership: Reverend William K. Adams, Nancy Adams, Johnston K. Adams, Elijah Wilson, James Forrester, Martha Forrester, E. Forrestor (female) , John Quween, Martha Quween, George W. Burnett, Sarah Burnett, Mary Mason,and Mayy W. Hampton. These people are first linked with Western Mt. Plesant, and later some of them at least were members of Briartown Church. We would be grateful for any information that someonecould offer us about the start of our church. Our sources are the above mentioned sheet of minutes, but no other Briartown Church minutes prior to October 1897 are in our possession. We have been in the Southern and State Baptist Archives, Macon Baptist Association of which we became a member in 1904, church minutes from 1897- 1998, and by various indidvduals. Briartown was a member of the Tuckaseige Baptist Association until 1904. 2:00 pm,on May 23 , 1914 . Also until the middle decades of the 1900,s, an elected pastor would only be at the church on alternate weekends. The other weekends would often find different preachers presiding over the services. For instance, Reverend Robert Barker conducted services the weekend of October 12, 1927, when Pastor J.M.Woodard was elsewhere. From its early history on ,special revival services have been conducted yearly, smoetimes more so. Possibly the last such series of meetings for the 1800,s lasted 16 days beginning on Saturday July 25,1899, with twelve members added by their professed "experience of grace" and baptisim. Pastor W.C.Hamrick was assisted by Rev.M.A.Leon and Rev.F.M.Morgan. 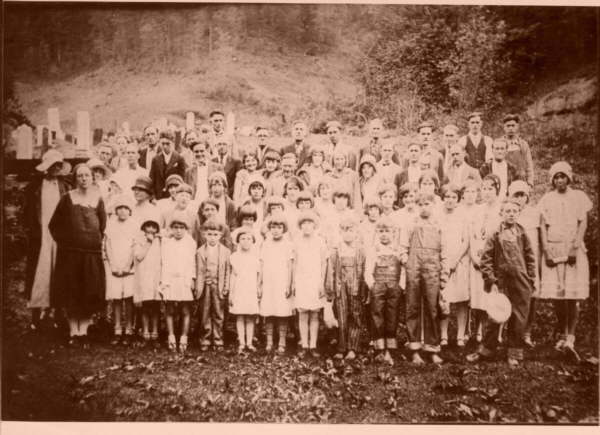 August 12, 1900 beganthe first revival meetings of this century. Rev.J.S.Woodard, after helping at least three other ministers, was elected pastor near the end of the month. The meetings of 1940 and 1946 each resulted in 28 professions of faith. The first was lead by T.D.Denny and Rev.George Cloer, and for the 1946 meetings Rev.Denny returned along with Rev.Floyd Sitton at the request of Pastor J.M.Woodard and the church. Woodard was also the pastor in 1925 when Rev.W.W.Marr ran a five- week revival. Thirty-four professed their hope in Christ and were baptised. BYPU and WMU were approved on Oct.8,1933. The work of the BTU was supported by the church beginning in Feb. 1946.
for the year. By the 1930's a transportation collection was sometimes given also. and a committee of ladies was appointed to collect additional money--- a few monts later they had an additional $37.65. (8) Active support for the Broyhill Children's Home and many other efforts throughout the years. dedication sermon was preached by Reverend C.C.Welch. Thie was the beginning of our current church house.Organ music was replaced by the first piano in 1946, and one year later electric lights were installed. Three years after this a new roof was built. Coal heating was replaced by oil heat in 1965, and 1974 saw three major changes-- a brick exterior, front porch, and stained glass windows. The building sits on property acquired or donated primarily in the year 1871,1911,1937,and 1981. From slightly more that ten beginning members, Briartown's history has seen 663 or more interred in its main cemetery and 86 in the nearby Bobby Hill Cemetery. This cemetery came under the care of the church in 1940. The longest tenures amoung elected officials are believed to be: Mark May--pastor; Oscar Hamilton--clerk; Weaver W Cochran--Sunday School Superintendent;and Dave L. Owenby--deacon. Convention in 1904 were J.M.Cochran, J.R.Wikle, and F.M.Morgan.